In CASARANO in a grat Inhabited Center, Town of South Salento, 15 km from the SEA and from the beaches of Gallipoli and TORRE SAN GIOVANNI, we propose our house for holidays or working trip at any time of year, the holiday house is on the ground floor and it is been restored in 2015. It consists of a large living room with kitchen and fireplace, two bedrooms, one double and one with twin beds (total 4 beds), a bathroom and large space with table and chairs, and outdoor shower. 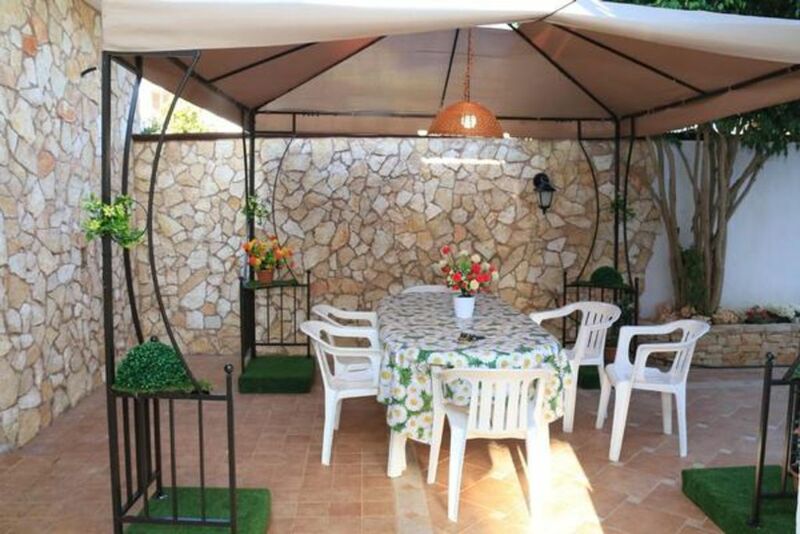 The house has wifi, air conditioners in the living room and bedroom and heating for the winter, fully equipped kitchen, dishwasher, and equipped with a microwave for heating up fast food, rotisserie and takeaway when you come back from long days at the beach or into the villages Salento. No more than 25 km to the south we arrive at Santa Maria di Leuca, with its famous staircase that leads to the Basilica de SANTA MARIA Finibus Terrae, right where they meet the two Ionian and Adriatic seas. From here you can book many boat trips, to visit its majestic caves, such as the Cave of the River, or the Grotto of the Nativity, or the Cave of the Three Doors, where the reflection of water creates a wonderful play of light . At short distancewith car (10 minutes) from the house you are in GALLIPOLLI, the important CITY 'Italian for Tourism and Youth for her beauty was named PEARL OF IONIAN, Kale Polis, the City Beautiful, as it was called by the ancient Greeks, is divided into two areas: the "old town" and the "New City". Always available to provide any information that might help you find the shortest ways to visit the Salent or places known to us. There are all comforts to spend a happy holiday, including washing machine and private parking, you will find and beach umbrella, beach toys for your children, there aren 't sofa beds or folding sofa. The area is absolutely QUIET, no confusion but not isolated. An ideal place to RELAX. Final cleaning: once per object Costs amounting to 80 EUR (Mandatory). Fuel for chimney/fireplace: per object and day Costs amounting to 20 EUR (optional). Intermediate cleaning: per object and day Costs amounting to 50 EUR (optional). Cot for adults: per person and day for rent at a price of 35 EUR (optional). The house is set in a residential area of ​​expansion, very rich of services and sales within walking distance as a few meters from the house and in support of a holiday with all possibilities and the choice of what to eat at the best price! !! In fact, in the immediate vicinity, there are great bars (Naburé, The Parmente) for well-stocked breakfasts and cocktails an appetizers, pizza, rotisserie with takeaway, supermarket, newsagent, post office and banks and many other services. Is there any form of fun and entertainment and a SEA Crystalline for a unforgettable holiday! The Salento is not a province, is a MAGIC HEART button, HOME, CULTURE and TRADITION FUN, a land to be discovered, that will remain in your HEART. (once per object, Costs amounting to 80 EUR). Air condition (Per property and week, to be brought by the traveller 50 EUR). Air condition (Per property and week, to be brought by the traveller 50 EUR). Bed linen (once per person, vorhanden 8 EUR). Cot (per property and day, included in price 0 EUR). Heating (per property and day, included in price 10 EUR). Heating (per property and day, included in price 10 EUR). Towels (once per person, vorhanden 7 EUR).